Author Lois Young-Tulin writes a tribute to her beloved great-aunt, vaudeville, song and film star, Sophie Tucker, Sophie and Me: Some of these Days. Almost 50 years after Sophie Tucker’s death, there is still enough interest and fascination about her that another film, The Outrageous Sophie Tucker, an Innovative Films production, will be released by Meneshma Films on November 7. The documentary will include an interview with Lois Young-Tulin, Ph.D. The director is Academy Award nominee William Gazecki, and the executive producers are 14-time Grammy Award winner Phil Ramone and Gene Schwam. Among the others interviewed are Barbara Walters, Michael Feinstein, Tony Bennett, Carol Channing, Bruce Vilanch, Shecky Greene, Paul Anka, Kaye Ballard, Chubby Checker, Connie Stevens, Mickey Rooney and more. Though, the movie has had some early showings, it will officially debut on November 7 in 10 theaters in Miami, Aventura, Miami Beach, Fort Lauderdale, Tamarac, Boca Raton, Delray Beach, Lake Worth and Palm Beach Gardens in Florida. A Philadelphia debut is not known at this time. See the trailer here. More information at Meneshma Films and sophietucker.com. 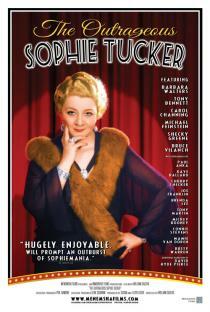 “Lois Young-Tulin’s book brought Sophie Tucker fully alive for me. Not just the sentimental old woman who reminded me of my grandmother on The Ed Sullivan Show when I was a child, not the tough dirty mouthed broad I got from imitations by Bette Midler, but the real Sophie. The loving, big hearted woman conflicted between family obligations and her God given drive to keep the songs and the cheers coming. “ I fell in love with the forthright way in which these two women forged a relationship. I felt as if I sat in the rooms of Sophie’s Park Avenue apartment or in front row seats at the Latin Quarter chatting with them, hearing their secrets and longing to tell them mine. This is a wonderful book that comes from love and lands us in worlds almost unknown to us today; the worlds of burlesque, The Follies, Broadway, movies, nightclubs and concert halls through out the Western World and then some. On Dec. 3, Ms. Prescott announced the launch of her new web site about her one-person show about Sophie Tucker, Some of These Days: A Jewish Woman's Journey Through Chutzpah, Passion and Pastry. Visit http://www.sophietuckersplayground.com. When Lois Young-Tulin, Ph.D. (Wyncote, PA) decided to write Sophie and Me: Some of These Days about her special relationship with her great-grand-aunt, legendary singer, vaundeville, and film star, Sophie Tucker, she wanted to reflect on the star’s influence on her and pay a long overdue tribute to her beloved Sophie. Additionally, Young-Tulin wanted to create a legacy so other women comics and entertainers would know what a trailblazer Sophie Tucker was for them. Tucker was an original, an early feminist, someone who “made trouble.” The quote above, the inspiration to a young Lois, to pursue a career rather than “just be a housewife,” indicates how Sophie was ahead of her time. Lois, now an established writer and teacher with a doctorate, has written a sensitive and touching portrayal, showing another side of this popular entertainer, who was known as The Last of the Red Hot Mamas, her signature songs, Some of These Days, and My Yiddishe Mama, which didnt reflect her own life, and whose career as a singer, vaudeville and film star, who also appeared on TV, spanned more than 60 years. Yet, she took Lois under her wing like a surrogate granddaughter, and was a mentor from the time they first met in 1950 when Lois was 10, until Tuckers death in 1966. Though, the book was published in 2001, Lois is still receiving requests to speak about Sophie, indicating how the popularity of the entertainer has endured. In 2005, The Jewish Women’s Archive of Brookline, MA organized an event to honor its founding Chair Board Barbara Dobkin. As part of the program a montage of funny Jewish women such as Molly Picon, Fannie Brice and Sophie Tucker was presented, with people talking about the entertainers’ contributions. From that event came the idea that more people should know about the legacy of these women. Two years later, the movie, Making Trouble, has been released. In addition to Picon, Brice and Tucker, Joan Rivers, Gilda Radner and Wendy Wasserstein are featured. Dr. Young-Tulin appears in the film talking about Sophie as the two legacy goals meet. The film is making the rounds of the country and was shown at the Philadelphia Jewish Film Festival on Saturday, March 22, 2008. Gail Twersky Reimer, the founding director of The Jewish Women’s Archive, was the Executive Producer of the film. Producer and Director Rachel Talbot makes her directing debut after producing five acclaimed documentaries; Philip Shane was editor, while award-winning Joel Goodman was the composer. The film has been an official slection in Silver Docs, San Francisco Jewish Film Festival, Boston Jewish Film Festival and Woodstock Film Festival and received Special Mention at Jerusalem Film Festival. For more information on the film and screening schedule see http://www.makingtrouble.com. For more information on the Jewish Women’s Archive, visit http://www.jwa.org. To read more about Dr. Young-Tulin and Sophie and Me: Some of these Days, see the press page and the rest of this site. (You can browse the book online! Lightning Source, a division of Ingram Distribution. Booksellers wishing to purchase the book should call 877-823-9235.